How long will your retirement nest egg last? This is an intricate question to answer and many factors come into play such as rate of return, value of your savings, annual withdrawals, inflation, etc. However, one factor that is very important and is largely not spoken of is the timing of when you retire. In fact, the timing of when you retire is so important it can make the difference between running out of money in retirement or leaving a multi-million dollar inheritance to your children and grandchildren. Let’s take 10 imaginary couples and pretend they have each saved $1,000,000 for retirement. Each couple invests the full $1,000,000 in the S&P 500 for the duration of their retirement, which we’ll assume lasts for a period of 30 years. Each couple also plans on withdrawing $100,000 per year from their portfolio and will increase that amount by 3% per year to account for inflation. The only difference between each couple is the timing of their retirement. The 1st couple retires in 1977, the 2nd couple in 1978, the 3rd couple in 1979, and so on and so forth. All else being equal, aside from the timing of each couple’s retirement, how will they each fare over a 30 year period? The disparity between the longevity and value of each couple’s retirement portfolio is staggering. Three out of the ten couples actually ran out of money before the 30-year period ends, simply because they chose to retire one year too early or one year too late, while the other seven couples end the thirty year period with balances ranging from $500,000 to $3,200,000. The three couples that ended up running out of money (1977, 1981, 1986) all had something in common. The first 5-10 years of their investment returns were sub-par. The perfect storm for a short-lived retirement portfolio is created when you pair investment losses with withdrawals in the first 5-10 years of retirement. You get so far behind, that it becomes impossible to catch up. This is known as “sequence of returns risk”. To put this into perspective, take a look at the table below regarding the most successful couple, who retired in 1979 and ended with $3.2 million compared to the least successful couple who retired in 1977 and ran out of money in 20 years. 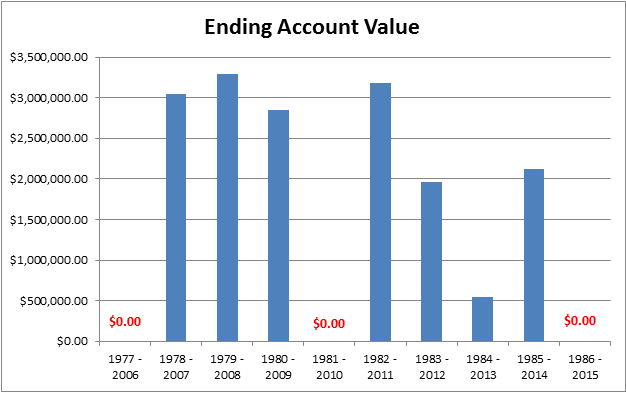 Although over the long term the S&P returned 1.48% more per year in 1977 – 2006 than 1979 – 2008, the couple that retired in 1979 will leave a multi-million dollar estate largely because in the first 5 years of retirement they have superior investment returns than the couple who retired in 1977. Don’t invest your entire portfolio in the S&P 500, or any other one asset class. For the most part, it is good for retirees to be invested in stocks. This protects against inflation risk and low yields in the bond market as we’re seeing now. Volatility comes with stocks and so it’s also important to include some bonds or bond funds in your portfolio as well to smooth out returns. Always keep at least the next two years of expected withdrawals in cash or short term bonds. In our example, each couple planned on withdrawing $100,000 per year and increasing that amount by 3% a year for inflation. So their first two years of retirement, they could have liquidated $203,000 ($100,000 for year 1 and $103,000 for year 2) and kept it in cash to safeguard against short-term volatility. This would have saved the couples who retired in 1977 and 1981. Both of those couples started their retirement with negative returns. Re-balance your portfolio annually. Re-balancing is simply the practice of selling high and buying low. If your portfolio is invested in 70% stocks and 30% bonds and the stock market underperforms the bond market for a year or so, naturally the stock portion of your portfolio will decrease while the bond portion will increase. If at the end of the year your portfolio is now made up of 65% stocks and 35% bonds. You can sell the 5% of bonds to reinvest in low-priced stocks or to keep in cash for future withdrawals. Aim for a lower withdrawal rate in the first 5 years of retirement. Your withdrawal rate is calculated by dividing your total withdrawals for the year by your total portfolio value at the beginning of the year. In our example, the withdrawal rate for our retirees starts at 10% ($100,000/$1,000,000), which is high for the first 5 years of retirement. As previously stated, the longevity of your retirement portfolio is greatly affected by your returns and withdrawals in the first 5 years of retirement. If each one of these couples would have started with a lower withdrawal rate, even 9%, they all would have had money left over at the end of the 30 year period. Start with a lower withdrawal rate and then increase it as your portfolio grows. In the end, the decision of when to retire isn’t as important as the plan you have in place to ensure your retirement capital lasts the duration of your life. Before you begin living the “golden years”, make sure you work with your spouse and potentially a financial planner to have a plan in place that will provide peace of mind during those years of market turmoil. [i] S&P 500 TR Index was used for returns cited. Past performance is not a guarantee of future results.